Motörhead’s Motörboat offers guests a once-in-a-lifetime opportunity to share an experience with their favorite bands and to see unforgettable performances on various stages throughout the ship and on the island of Great Stirrup Cay. 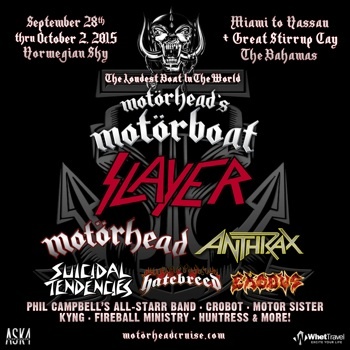 2015 marks the first excursion on Norwegian Sky for Motörhead’s Motörboat. The contemporary ship offers 13 complimentary and specialty dining options, 12 bars and lounges, a coffee bar, an outdoor pool, and five hot tubs. While onboard, guests can try their luck in the Sky Club Casino, relax in the onboard spa and get their heart pumping in the fitness center or full basketball court. 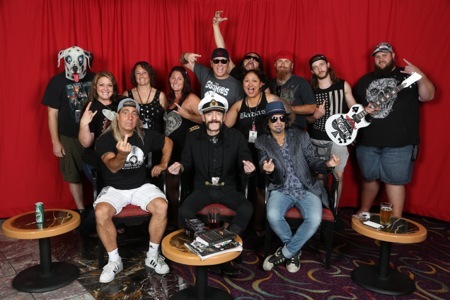 For the debut Motörhead’s Motörboat cruise in 2014, an international, multigenerational audience from over 30 countries came together to celebrate the legacy of the cruise’s iconic namesake and escape into five days of true rock ‘n’ roll living with no holds barred. Highlighted by a pair of ear-splitting performances from Motörhead themselves, Motörhead’s Motörboat 2014 featured more than 30 performances by 15 of rock and metal’s top artists, including heavy metal all-star band Metal Allegiance, Anthrax, Testament, Down, and Zakk Wylde.